Hi I'm from Houston, TX and my question is; do you believe that the spread of HIV and AIDS in third World Countries are due to the lack knowledge, funds, or treatment? I hope they will match donations with their own money. I have lived off of $6,000 per year since i was 16, now im 23 still in the same situation. I have no parents and im trying to finish my B.S. so that I can too make money and give back. I see people in poverty everyday and it's terrible to see. It breaks my heart, I feel blessed that I have as much as I have given my situation. ALicia Keys, J.Timberlake, Lady Gaga have so much money it is unbelievable. Instead of buying expensive clothing and living a life of excess they should use their wealth to be even more proactive in this world. Try being more humble and giving more of your "hard earned" money to organizations everywhere. Use your celebrity status for more good. your fans can help, but you shouldn't rely solely on them for donations. Most are probably poor like myself. Also, participation and your time is important too. My name's Vanti and i'm from Namibia, Africa. Alicia, how does it feel to be such an inspiration to so many African children? Your humanitarian heart touches these childrens lives in ways that are unimaginable. You trully are a great Person of this earth, as John Legend puts it. Its nice to see other causes become commercial. I hope this has the success of Breast Cancer awareness. houseofnumbers.com to see the trailer. It is nice to see that people are trying to raise awareness of different problems around the world. One of the other people asking a question brought up an intresting point. The way to get more people to give is to pledge a match of every dollar spent. It gives people hope and a goal to match. Trust me there are much better things to do than hear what everyone is doing on Twitter, Myspace, Facebook, etc. If you and your friends promise to match every dollar raised up to a couple million dollars through this stunt, I will gladly donate. Are you willing to make such a pledge? Not to undermine the efforts of the celebrities, but it takes the threat of "not updating their Twitter/Facebook status" to raise money for a global cause??? So, these celebs are actually doing less by not updating their Twitter accounts and want us hard working Americans to donate money, I will donate but not cause they stopped tweeting. It's people like Ashlee that are the biggest donators per capita and probably usually gives big tips cause she knows what it's like to work for a living. I think i might just stop using twitter!! Stay Dead, don't bother resurrecting yourselves, it will only play into your jesus complexes. They essentially making people pay to follow the lives of formulated mindless popstars, Some might say bullying or extorting money from their so called fans (sources of revenue) until they get their own way. Don't get me wrong, it is for a good cause but seems the wrong way to go about it. People should be boycotting Facebook anyway given that Zuckerberg welcomed George W. Bush with open arms. People should be very wary of that too. Facebook and Twitter – BORING, Try real interaction people instead of pretending to be something your not online, try it in real life, its harder but more rewarding, you will be a real person, not an invention. Hi Alicia I'm from The Bahamas. You should come to the caribbean and do a concert tour to spread awareness and some appearances at the local schools to talk to the kids. Also visit the AIDs camps and see just how desperate the situation is and how oblivious most locals even are to the means these people live in, in their own society. I think most people are very aware of the epidemic but still believe in the 'it cant happen to me' scenario. Hello Alicia im writing this from South Florida. I would like to know if there was any way for other people to become involved with KCA and input some ideas to help raise awareness. These people are all multi millionaires yet they expect Bob the streetcleaner to donate money that he needs so much. What a sick and twisted world this is. –	How will you Improve Medical Help to the 33.3 million people living with HIV? –	How will you Improve STOPPING THE AIDS VIRUS in Countries where the AIDS Rate is Extremely High, such as Botswana, Lesotho, Malawi, Mozambique, Namibia, South Africa, Swaziland, Zambia and Zimbabwe? –	Why did you named your baby boy Egypt? I am awaiting Alicia’s replies. Wow, I think most of you are missing the point. I think the financial crisis we are living in has hurt us so much, that we have become negative in our thinking. We lash out at others, even in the midst of doing good. All of you who are going through a rough time, I pray it gets better. There will be a turn around. Get positive and stay positive. This is not about Twitter of any other social media site. The point of the campaign is show how we (and I mean all of us, especially in America) value lives based on the haves, the have not's. The purpose of the social death is to show the world that these individuals value the lives of others as they do themselves. When a celebrity dies, it is all over the news and in some instances, say Michal Jackson for instance, it seems the world stops to morn them. But what about the mother of two in Africa who died of AIDS and left her two children orphans? Or the young man that lives in your neighborhood that just passed from the same disease? You never hear of them. Thus, the purpose of this campaign people; to show that every live has value and that we all need to be concerned about each one. Why do we blame artists and celebrities for the fame and fortune we gave them? It was us who gave it to them. They are merely using their platform to get YOU INVOLVED. Bottom line. Yes, they all could donate money, and how do you know they haven't? The goal is to get everyone involved WITH THEM to support AIDS research. I love it. I think it is an awesome idea. I totally support it and have joined the cause. Alicia, I hope you raise more than a million. God bless. I was born and brought up in Africa and i have lived my last 22 years in the western world. feeling disgusted about the hypocrisy that exist among people around the world towards important issues about life and wealth, i come to realise that the help people claim that they want to provide to others in need don't get far enough. it is time billionaires & millionaires have to focus on their own life's problems. everyone on earth has problems but most of the time, they try to decieve others that poverty is the only problems that ever exist on earth. poverty is a state of mind not problem because money can,t buy life or make life happy & immortal. lets stop decieving one another people . educate or leave those you call poor people alone, aids is man made evil for their fellow human, untill those who made aids that kill their fellow human stop to exist, the world will not be a better place. Hi, my name is Li Hua. My questions : what is the best way to find out if the partner is STD carrier in a nice way? it seems like all the celebrities involved in this scam (and i call it that simply because no body who is asked to donate knows how the money will truly be spent) are feeling a bit down about themselves. look, i'm not knocking success, if you've worked hard and made a lot of money, then good for you; i respect that. so why then are you asking people for money? so to make yourself feel good about, well, yourself? i dont agree with that... and the whole ploy, not updating twitter or whatever the hell it is, i mean that just shows you what this world has come to. technology has reached the point of diminishing returns and is now counter productive in society; especially when a person follows another person on twitter. Hi Alicia Keys, Compliments of the day to you. I am Egelle Emenike writing from Nigeria. Do you truly believe that HIV/AIDS is widely noticed in Africa? Is your focus then for the campaign largely on Africa? Would it be nice then to say that researches being carried out on the cure of HIV/AIDS should be done with the African person living with the syndrome. My humble suggestion is, Let the campaign and researches be focused on the African living with HIV/AIDS. Alicia, It's great what your doing ,when I went to south africa to the ghetto's it really opens your eyes – what you see . Children who catch HIV and Aids from their Parents , that is cruel and you have to fill sorry for them . Lack of knowledge and education -that's the problem ,if they knew how to prevent things from spreading – it would decrease in Numbers. But what are the Politians doing ? in there countries -they have the power to stop it . There the ones you should wake up and make them listen . Good luck and hope you can help these people who are suffering t.
Do a round a world concert to raise money for them . Ask the pope and other reglious Leaders for backing aswell. How about fans not following the celebrities until they donate 10 million? That sounds easier and faster. I always dont understand the reason to as why all of these celebrities start these so called charities for various reasons and then go towards the public and ask for money. It never makes sense since the general public does not have enough money compared to the amount of money all of these celebs has. My Question to Ms. Alicia Keys is "Is this the way celebs like you make your self even more popular ?" 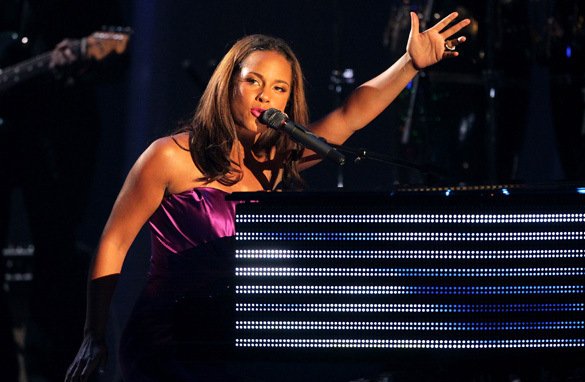 Alicia Keys has always been helping and doing her best to help the world. I knew a guy from university that worked with Ms. Keys on a charity foundation, and in my opinion, it seems that she is the type of human being that just wants a better world. I hope this succeeds, and I am going to help out! the artists involved in the event are respected and are mostly philantropists. but what i want to point out is the fact that i dont want it to be a replica of the USA /Africa we are the world concert where ,nothing really changed afterwards. Millions have been raised and spent! another one wont kill...but here is my advise: The amount, whatever it is, 95% be spent on the actual cause! Now a days, the best projects only get 80%!! And please, dont waste time and money with cure(that will come in time) but concentrate on "PREVENTION"!! Thats where we can REALLY save lives!!! Keep it up! I think its fantastic that you and your fellow musicians are using your celebrity status for good causes. Your talent is endless, but how do you find a perfect balance between your music, your family life and your charitable interests, ensuring that you give all of them 100% of your dedication? I'm writing from nigezie in Nigeria, i just don't think their idea of showing their faces on coffins is worth it at all, who ever feels the cause they are fighting for and is moved would definitely want to donate and more over why don't these celebs, start wit giving out some reasonable amount of their wealth. Thank you keys am writing from Kenya, you have shown the rest of the guys how life is of great importance. I see orphans who are left behind because of their parents dying of HIV aids related illness, they end up being hopeless in life and turn out to be practicing some vises in the society like thuggery and prostitution because they have no option in their life. you are indeed a hero and we celebrate you. AIDS was seen as so 1980’s yet we are still in the same position now as we where back then. Why do you think we are still blasé about AIDS and HIV? Hi Alicia, you are one of the people i wanna look at any time . Iam from Uganda and thank you so much for the good world you are doing for children there . we love you and appreciate very much.how can i donate to ur charlity i dont have alot but try my best to make the world a better place to live.May GOD BLESS YOU AND YOU BABAY BOY . How did you/y'all come up with this amazing campaign? What an incredible way to use mobile and social technology.